Cassini got some incredibly tricky shots during its January 11 Rhea flyby! I've spent the last couple of hours drooling over the raw images website. Here's one great composition, a color shot that was part of an enormous mosaic of Rhea that just happened to catch Dione and the rings wandering through the background. Prometheus is in here too, just below and to the right of Dione, but it barely rose above the level of the JPEG artifacts in the image. If you want to know how I made it from the raw images, go to the bottom of this post. But first of all I've got some more amazing stuff to show you. Such as this one, in which there are five moons visible. I've posted a Cassini image where it got six moons in one shot before, but I don't recall Cassini bagging three of the big moons in a single frame before. This is quite spectacular! On January 11, 2011, Cassini captured five moons and the rings in one wide-angle shot. The large moon is Rhea (which Cassini had just flown past). 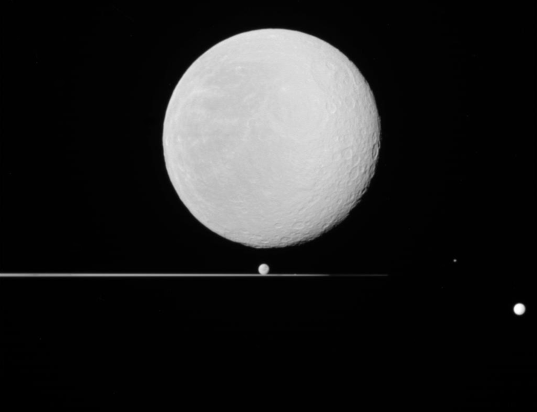 There are two large icy moons in view. Below Rhea, just above the rings, is Dione. 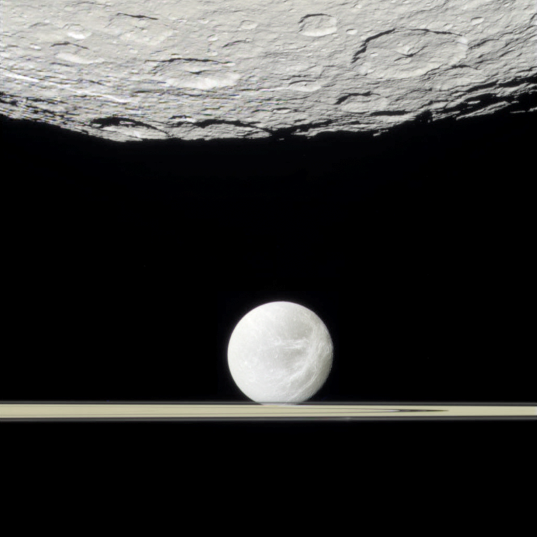 Below and to the right of Rhea is Tethys. There are also two "rocks" visible. Prometheus makes a tiny lump on the rings to the right of Dione, and Epimetheus floats between Tethys and Rhea. There are some wondrous high-res views of Rhean terrain. I like this one which has a sharply linear chain of craters. Or this one with a bright (fresh?) crater at the center. This one is incredible -- it was nearly incomprehensible when I first saw it but then I found the wide-angle camera context view which shows you we're sighting obliquely across the near rim of a crater to its far rim. In fact this pair is so awesome that I have to include it here. I rotated the images so that the "ground" is "down" which helps a little bit in making sense of the narrow-angle camera image. 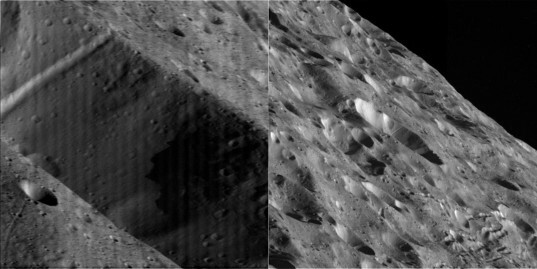 Near its closest approach to Rhea on January 11, 2011, Cassini snapped a pair of images with both cameras. The left image is with the narrow-angle camera, which has ten times the spatial resolution but only one-tenth the field of view of the wide-angle camera. The two cameras have the same boresight, so the narrow-angle camera image occupies the center 10% of the wide-angle frame on the right, covering the middle of a large crater that Cassini is viewing obliquely. Similarly there's this frame, which is motion-blurred -- this must be the one taken nearest closest approach -- and here's the wide-angle context. Meanwhile, they're all interspersed with shots of the great northern storm like this one (which throws an extra moon in there for good measure!). All in all, it was a spectacular flyby! !